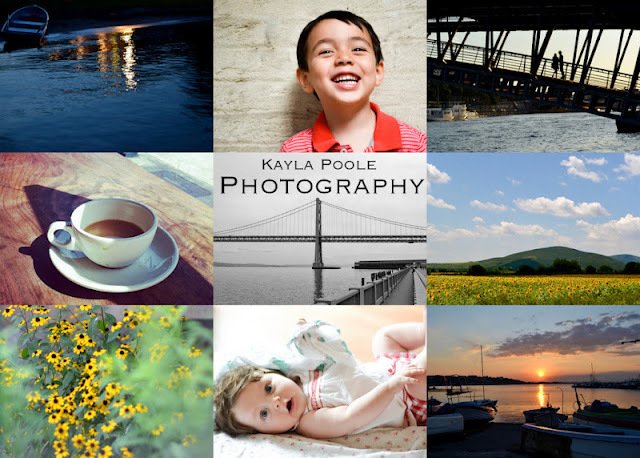 It is with great pride and excitement that I present you with my professional photography portfolio and official launch of Kayla Poole Photography. I've been quietly working on this all summer, and am thrilled to finally share it with the world. Presently, I'm offering baby & children's in-home portraiture sessions, combining two of my greatest loves; kids & photography. I'll be detailing my services further in a post tomorrow, and am happy to provide a rates & package overview list by email. I am also open to collaborating on other lifestyle projects, including but not limited to: love shoots, family sessions, senior portraits, maternity portraits, etc. I would love if you'd hop over to take a peek at my portfolio and let me know what you think. I'm still figuring out where all of this will lead me, as I'm continuing to teach full-time come September. I can't wait to further develop and grow my business in the months ahead. I cannot say it enough, but truly, thank you all so much for rooting me on in this space here and in the endeavors I undertake. Exquisite Banana continues to change and better my life everyday: I am constantly humbled by your interest in the pictures I take and the stories I share. You're my people, and I love you. Congrats, Kayla!! These are exciting news!!! All the best!! SO happy for you Kayla!! What a striking portfolio you have, love the site!! How exciting! Looking forward to seeing where you're taking this. Kayla, these photos are amazing!! Congrats and best of luck in your new endeavor! You have a great sense of catching the right moment. When I have kids, hopefully soon, I'll make sure I have you help me keep these moments forever. For now I have to say my very favorite is the sunflower field. Let me know if you sell the rights for it. Thanks so much, Maya! What are you looking to use it for? Are you interested in a print? I'm hoping to offer prints soon, I just need to figure out a few logistics. I will let you know as soon as I get it all together. (and yes, that sunflower field is absolutely high-res. I actually have it on a 16x20 canvas in my living room! http://www.exquisitebanana.com/2012/02/when-youre-sick-surround-yourself-with.html). Eeee! How exciting! I have no doubt that this will be a successful endeavour. The photos you post on your blog are always so beautiful. They catch the light just so, and they always evoke such positive feelings. I looked at your photography portfolio, and those pictures of the kids are fantastic! So natural and full of fun. So happy for you! Teacher + photographer = a winning combination! Thank you, Erin! It's so fun to interact with the kiddos behind the lens. A few of those photos in my portfolio are of former students. Awww, how exciting! Way to take the leap and do something else you are passionate about! Can't wait to see your site, hear about your first session, and of course see some more great pictures. wow, kayla, this is so exciting! congratulations and best of luck, looking forward to more lovely pictures of yours! Love you, Kayla!!! Congrats on this latest endeavor!!! Headed over to your portfolio site right now. ADORE AND MISS YOU!!!! Kayla!! Congrats, it looks amazing! You're a superstar. All I can say is HOOOOOOOOOOOOORAY!!!!! Kayla, this is SO exciting for you! Just clicked over to the site and it looks great - BRAVO! Meant to say... I would totally get you to take photos of my boys if I lived anywhere near you! Perhaps one of us needs to do a bit of travelling? Lots of love to you. Enjoy these last lovely weeks of summer vacation! I would be honored to photograph your boys. Hopefully it can be arranged sometime in the future! Kayla, what a fantastic project! Congratulations!! I'm so excited that you're doing this. You're such a natural with a camera and with kids -- I can't wait to see how your portfolio grows! So happy to see this & excited for you. Your kids' portraits are incredible! Thanks so much, Alli, that means a lot. Ahh! Congratulations - this is awesome! And those photos of the baby above are AMAZING. What a cutie!! Thanks, Shoko! You should have seen me when I got to hold her. Mush. this is so exciting! I'm thrilled for you. your images are lovely and you really capture the moment beautifully. congratulations!